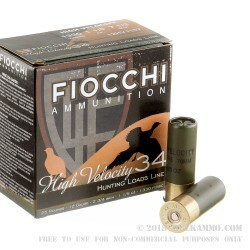 Fiocchi’s High Velocity line up of shotgun shells are designed from the ground up just for the bird hunter. These rounds allow them to maximize the experience of hunting all day long, and harvest as many birds as they legally can. 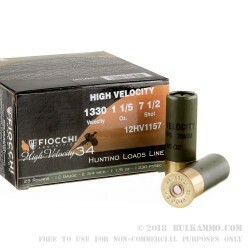 The Fiocchi High Velocity 12 gauge 2 ¾” hunting shot-shells are loaded with 1 1/5 of an ounce of their #7.5 lead shot. They provide a comfortable level of recoil and have a documented muzzle velocity of 1330 feet per second. Fiocchi uses Boxer primed, reloadable, olive drab green hulls, with tough high brass head, and a thicker rim to ensure reliable extraction and feeding in your shotgun. These Fiocchi shotshells come in packs of 25 rounds, in a 10-box case, making a total bulk pack of 250 shells. 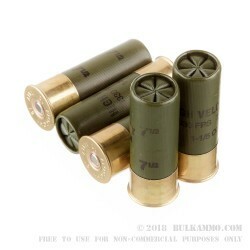 Perfectly suited for hunting all types of Upland Birds such as the Quail, Chukkar, Pheasant, or Dove, these rounds will be a stellar upgrade to your next hunting trip. Grab a couple cases and head off to your local range to sight in your new double barrel, pump action, or semi auto shotgun.